Natural and man-made risks have long been recognised as vital conditioning factors in the formation of social institutions and the conduct of social life. In this volume internationally recognised experts examine in detail the implications in practice of the modern concept of risk in particular legal fields. 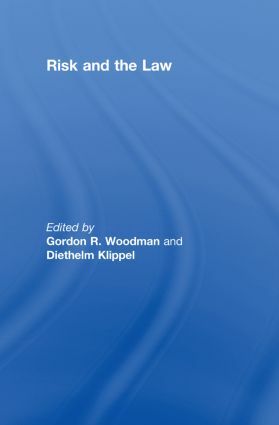 The chapters explore the ways in which the law in its many branches can accommodate, manage and reduce the extent of risk in the modern "Risk Society", matters of pressing importance for the development of all branches of law in all jurisdictions. The fields of activity affected by the issues discussed include law, medicine, insurance, state security and public health. The collection also contributes to comparative legal studies in respect of risk and the law, presenting a perspective which has largely been neglected outside the works of general theory. Thus the topics considered range from the civil law of injuries in Germany and the food law of the European Union, through sales of goods, including international sales, in English, German and French law, to the English law of torts. Risk and the Law, written by specialists who are authorities in their fields, will be of interest to academics and students who are interested in new developments and ideas regarding the relationship between risk, law and social change in many different fields.